Marines crouch behind the seawall on Namur, February 1 1944. The UNIS marking on the back of the center man – 415 in a semicircle – identifies him as a member of Company D, 24th Marines. Dog Company was the heavy weapons outfit of First Battalion, 24th Marines. The majority of the men who made up Dog Company joined their company at Camp Lejeune in the late fall of 1942. Most of them learned to use the heavy Browning M1917 water-cooled machine gun; others trained on the 81mm mortar. They were specialists, but still front-line troops. In early 1943, they traveled to Camp Pendleton, California, where they became Company D, First Battalion, 24th Marines. Marine heavy weapons companies did not deploy as a single unit. In training and in combat, each of the three machine gun platoons was assigned to support one of the rifle companies and was controlled by that company’s commander; the heavy mortars were deployed with Battalion HQ in order to provide fire support for the entire battalion, as D/24 did in the invasion of Namur, pictured above. 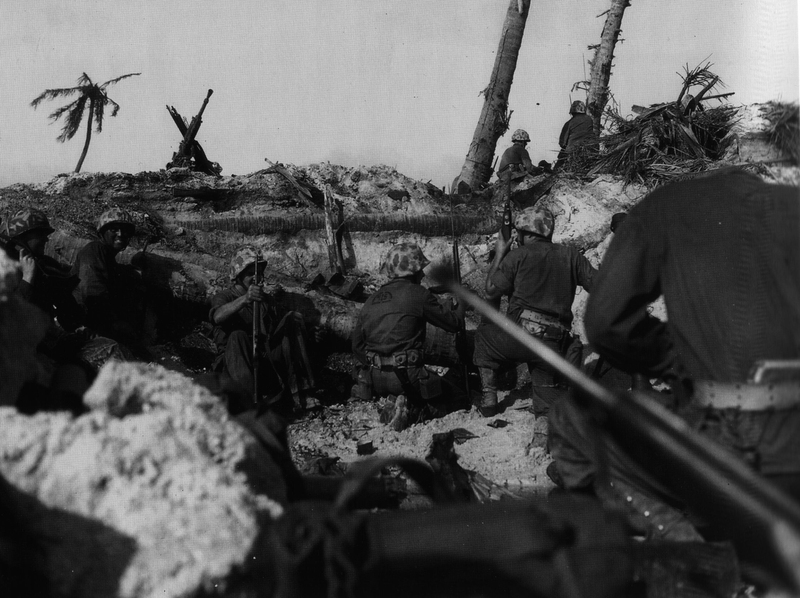 The weapons companies of the 24th Marines had a particularly brief existence. In March of 1944, the Marine Corps reorganized and eliminated the weapons companies from its infantry battalions. Companies Dog, How (2/24) and Mike (3/24) disbanded, and the Marines were reassigned among the rifle companies. Corporal Glenn Buzzard reported that the move was done with typical Marine Corps logic: the First MG Platoon went to Company A, the Second to Company B, and the Third to Company C – while the 81mm mortars and support personnel went to the Battalion Headquarters. Dog Company men fought (and in many cases, died) with the rifle companies for the rest of the war. View individual biographies of the members of Company D.
Decorations shown were awarded for service with Dog Company. The links all went to an older version of this site, which has been taken offline. I’m working to get the information back up as soon as I can. I’m very sorry for your loss. The older site had biographies for every individual, and eventually the new site will as well. If there’s anything you’d like to share – pictures, stories, or anything at all – you can contact me at webmaster@ablecompany24.com, and I’ll combine it with any information I have to finish your grandfather’s page first. Found this website completely by accident. So excited. My dad was Joey Chalifour. My Father was Bernard B. Novak. Shot through eye and survived. Received silver star metal. Died at the age of 86 yrs. old of natural causes 12/25/2010, 11:00 am. Christmas morning. Father of 4 Michael, Anthony, Dorothy & Steven. Wife Gayle. The most intelligent & honorable man I ever met, My Father Sgt. 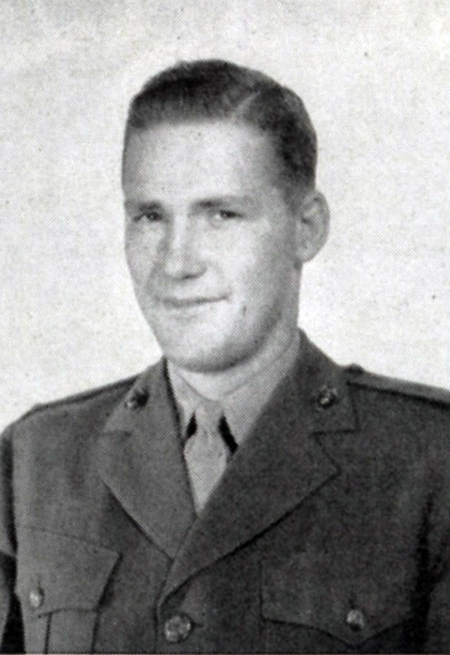 Bernard B. Novak U.S. Marine Corp. !! My name is Andrew Swoyer. 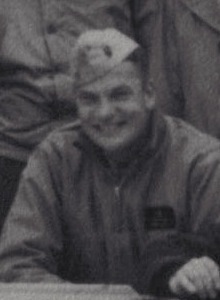 My father was Lt. Joseph D. Swoyer of “D” Company and he mentioned in his letters that he wrote to his parents, that your father had saved his life on more than one occasion. I was wondering if you would like some scanned letters where my father writes of the things your father did to save his life. My uncle, Cpl. Orest J. Santillo 4th Div. 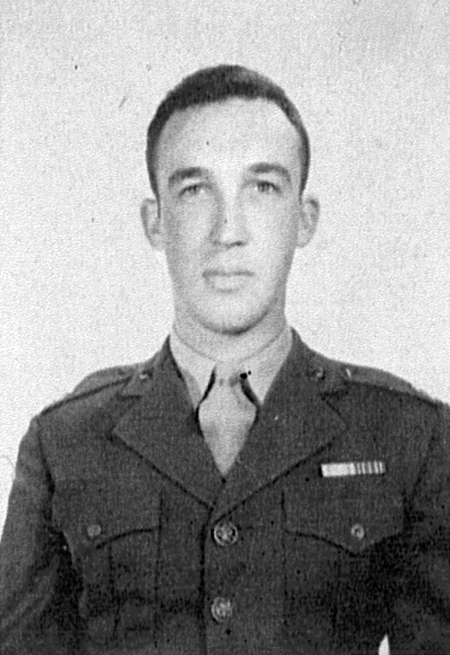 1st Bat., 24th Marines, company D, was killed on Tinian in July, 1944. I was only 1 yr. old and never knew him and my family has little information about his circumstances. If anyone can provide some information or remembers him it would be greatly appreciated. Hi Carmen! Thank you for writing. I have some additional information about your uncle. Would you please email me at webmaster@ablecompany24.com? My, dad, Woodrow Barfield, saw action in WWII, Korea, Vietnam, retired as a Sergeant Major. Always looking for pics of him. My Grandfather was Harry R. Schueneman Jr. I was hoping to find more information/pictures, etc. on him. I never got a chance to meet him, and I really want to know more about him. I am trying to find more pictures of my great grandfather, Daurice Ray Naron. I was 12 years old when he passed away and I never got the privledge to hear his stories and fully understand them. And being in the Navy serving with the Marine Corps, I would take great pride in knowing/seeing him where he served our country proudly and honorablt. I have been trying to find pictures of him during the war for the longest time. If anyone has anything on him, or with him, i would greatly appreciate it. Nice to hear from you. Just sent you an email regarding PFC Naron. My Uncle, Michael Kerelejza was in the 4th Div., and fought on Iwo Jima, If anyone has information that you can share I would be very grateful.